Hydrokinetic devices typically use vertical or horizontal axis turbines similar to those developed for wind generation; however, because water is approximately 850 times denser than air, the amount of energy generated by a hydrokinetic device is much greater than that produced by a wind turbine of equal diameter. In addition, river and tidal flow do not fluctuate as dramatically from moment to moment as wind does. This predictability benefit is particularly true for tidal energy. It can be predicted years in advance and is not affected by precipitation or evapo-transpiration. In Alaska’s riverine environments, water flow fluctuates, often dramatically, on a seasonal basis. Snowmelt from glaciers and seasonal snow accumulation contributes significantly to the total water volume in Alaska’s waterways. Generally, flow rates are the highest during spring snowmelt, but this higher flow is associated with significant debris flowing within the water channel. Debris is often directed to the fastest area of flow (the thalwag) and is not necessarily confined to the surface. In the winter, river flow often drops off dramatically and is largely supplied by local groundwater. This fact coupled with challenges associated with ice/turbine interactions leaves open to question whether hydrokinetic devices would be cost effective during winter months in most Alaskan rivers. If hydrokinetic devices are only deployed seasonally in riverine environments, an imbalance between resource availability and electricity demand (which is often highest in the winter months) will result. It is possible that in dealing with resource and load fluctuations on short time periods, energy storage could be utilized or excess energy could be dissipated for heating purposes (see the Energy Storage section for more information). The hydrokinetic working group agreed that commercial projects will likely be operating in the state in the next three to five years. The group was not ready to make specific recommendations (see below) for hydrokinetic projects for specific villages in Alaska. Recommendations from the working group are less project specific. They are tipped toward finding appropriate ways to move forward with this technology. The members of the working group stressed that its success is tied to not overestimating the maturity level of the technology by skipping over beta testing and demonstration phases. Hydrokinetic energy represents a real opportunity for power generation using local resources at select locations in Alaska; however, there are still numerous environmental and technical challenges associated with this technology. For example, there are concerns related to interactions between turbines and both adult and juvenile fish, since most communities with hydrokinetic resources are heavily dependent on local subsistence and commercial fisheries. Additional concerns include ice interaction with infrastructure, silt abrasion, submerged debris which could damage turbines, navigation hazards, and impacts on marine life. The actual construction and operation of a pilot device or devices will result in a more complete understanding of technical, environmental, and cost factors associated with hydrokinetic energy. This would provide a solid starting point for additional cost and economic analysis for specific sites around the state. Cook Inlet – In 2008, Ocean Renewable Power Company, LLC obtained a FERC initial permit and the company is in the process of applying for a pilot project license to begin development of a demonstration tidal project near Fire Island that will connect to the Fire Island intertie. The site could ultimately yield an estimated 17 MW of power, enough to power 17,000 homes. ORPC intends to install the project in a phased approach with the first devices being deployed in Cook Inlet in 2012. Gastineau Channel – The FERC permitting process has begun for a demonstration project in Gastineau Channel, which could ultimately provide up to 24 MW of electricity generation to supplement Juneau’s already existing hydropower sources. Nenana – Ocean Renewable Power Company and Alaska Center for Energy and Power have preliminary permits to establish a hydrokinetic testing site in the Tanana River near Nenana. 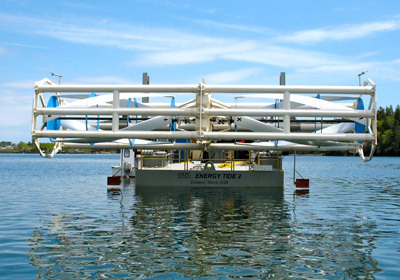 The site will provide testing grounds for a variety of hydrokinetic devices, with the first scheduled to be in the water by summer 2010. The pilot project license application was submitted in Fall 2009. Iguigig - The Village of Iguigig is working with AEA to develop a test site that could be used for many different projects to determine which one is the best value for the money. This testing is set to start the summer of 2013 and after testing has concluded the Iguigig Village Council will choose which device to keep in the river and to produce power for the village. Develop guidelines and protocols on how to initiate projects. Develop methods to prioritize potential projects. Conduct additional site-specific resource assessment in Alaska, including screening of locations with a list of compatibility factors, to determine optimal sites. This is necessary for project development and does not commit the state to failure by deploying technology too soon. Quantify and streamline permitting requirements, and draft a recommendation to have the state review FERC licenses. Encourage communities to protect their own interests by applying for site permits near their locations. Conduct more research as needed in terms of impacts on fish populations. Involve the University of Alaska as an independent source for device testing. Support demonstration and pilot scale projects to come up with defensible numbers (projections) for future project costs. Get data on how devices are working and how manufacturers can improve and modify devices. Optimize technology for Alaskan environments. Support development of a coordinated national research program to avoid multiple small failures in disparate locations. Position Alaska (possibly through the University) to take a leading role. Such a test center could also serve to promote cross-fertilization and standardization of ancillary equipment, such as development of a universal platform for installation of turbines, including a deployment strategy. • Environmental concerns, especially with regard to impacts on fish must be addressed. Fishery resources in Alaska have unparalleled value for subsistence, sport, and commercial use. It is critical that hydrokinetic energy development be fully evaluated for impacts on these resources. • Survivability and performance issues must be examined. Alaskan waters have many hazards for hydrokinetic devices, including high rates of sediment transfer in river beds, debris, and ice. These issues also complicate the design of anchoring and cabling systems. • Resource assessment is necessary. There is a shortage of river velocity and depth data, particularly for winter months. • Effects on navigation are important. Many of the fast flowing rivers in Alaska with potential for hydrokinetic development are also major waterways for barge delivery of bulk materials to isolated communities. A major consideration is that these devices not impede river traffic. In-River Systems: A link to the Alaska Renewable Energy website. A great source to learn about upcoming renewable energy projects in Alaska.